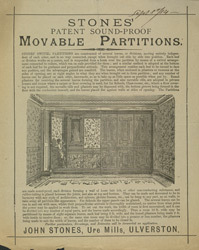 This is an advertisement for John Stone’s shutters and particians. Curtains, blinds and shutters were very important for the 19th century housekeepers in helping to protect the ornate furniture, patterned carpets and decorative wall hangings. The sun faded and damaged the furnishings and so fitting window screens prevented the sun from shining directly into the rooms. There would often be both shutters and a curtain and as well as blocking sunlight in the summer they helped to keep in the warmth in the winter.